Does the “Best” Team Win the World Series? It’s been a few days. And although I ain’t over it yet, I think I can write about the Detroit Tigers losing the World Series. When the playoff in baseball began, 10 teams – and their fans – were very happy. But the playoffs being what they are, we knew that only one team – and its fans – would actually be happy when the whole thing was over. After the best-of-five series, the Tigers – and this fan – were quite happy. When the Tigers swept the Yankees, I was very happy. And then when the Giants swept the Tigers… okay, I wasn’t happy anymore. So what did the Tigers and all the other “losers” (and yes, that includes the Yankees) learn from the playoffs? As Mlodinow notes, a seven-game series is not a sufficient sample to identify the “best” team. So that means we are not sure at this point that the Giants are better. And I am not just saying that because the Tigers lost (okay, I probably am just saying that because the Tigers lost). The idea that the World Series doesn’t necessarily identify the “best” team relates to something I said in this forum a few weeks ago: team spending and wins in baseball are not strongly related. In fact, in some years (like 2012) there isn’t even a statistically significant relationship between payroll and regular season wins. But let’s imagine for a moment that there is a link between spending and winning. 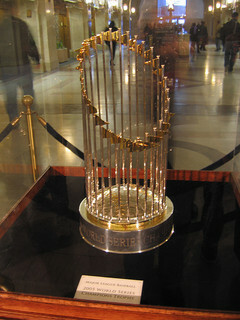 In fact, let’s imagine that if you spend enough money you can guarantee that you will have the “best” team in baseball. Would that be enough to guarantee your team a World Series title? Winning percentage: This may seem like the most obvious definition of “best.”Across a 162 game season the team that wins the most could be thought of as the very “best” team. Pythagorean Win-Loss: Baseball-Reference.com defines this as the expected win-loss record based on the number of runs scored and allowed by the team. from 1969 to 1993, four teams made the post-season. from 1995 to 2011 (there was no post-season in 1994), eight teams participated in the playoffs. this past season, ten teams were in the playoffs. Given these definitions, how often has the “best” team won the title? Top team in winning percentage won the World Series 7 times. So no matter how you define “best,” the “best” team in baseball failed to win the World Series half the time when four teams made the playoffs. Top team in winning percentage won the World Series 3 times. Again, being the “best” doesn’t seem to guarantee a title. More than two-thirds of the time, the “best” team fails to end the post-season as a very happy team. So even if a team could increase its payroll and buy the “best” team, the playoffs in baseball are simply not designed for the “best” team to consistently triumph. And that means teams should be very cautious about responding to what they see in the playoffs. The Yankees inability to win against the Tigers in the American League Championship doesn’t necessarily mean the Yankees need to make major changes for next season. Every baseball team – not matter how it is constructed – is going to have a bad week once in a while. And if that bad week happens to occur in October, your team will look bad in the playoffs and your fans will be unhappy. I should add, this was very much the argument Steve Walters (economist at Loyala University and consultant to the Baltimore Orioles) recently made at the Wages of Wins Journal. The playoffs are simply hard to predict. As Steve noted in the videocast, even winning more than 100 games is no guarantee of a World Series title. Across the past 25 years, 20 different teams have finished the regular season with more than 100 victories. And of these, only two managed to win a title. Interesting to actually put numbers to how often the best team wins the World Series. I think many people assume it is often with the thought that over the course of a series, the better team will inevitably win more games. Of course, this doesn't take into account postseason pitching rotations, the strategic difference between managing under NL rules versus having a DH, and the overall streaky nature of baseball. I would be interested to see a similar study done with the NBA Finals. Great article. Does this imply any manifestation or romantic nostalgia of "dominance" for any sports franchise "dynasty" is more of a fantasy myth cooked up by media and marketing teams ? A 7 game series is 4% of a typical 162 game season. This is what often makes the "best" team very beatable. It's very rare (I assume, no stats) to have the "best" team peaking at the end of the year, especially when the lesser team is usually playing better at the end of the year as they struggled to get into the post season while the better team was able to coast. But then you have the 1998 Yankees (114 wins) who win it all and the 2001 Mariners (116 wins) who lose in the ALDS. It's just such a small sample size that the difference between the two teams is often only 10-20 wins over 162 games which is only 6-12%. So over 7 games all you need to do is win 1 more game than the other guy. The Giants didn't just win a 7-game series. They swept. I'm no certified freakonomist, but that has to signal a greater degree of superiority. Of course the "best" team doesn't always win the World Series or any other game. That's why we watch, to see how the players react to specific situations, to see surprising things happen, and sometimes even to see the "better" team get their comeuppance. The better team is almost be definition one that doesn't choke in the championship series. Or it may be that teams competing in a world series is "Intransitive". Example: Team A always beats team B. Team B always beats team C. But team C always beats team A.
Intransitiveness is a property comparing two groups that clearly shows how different team sports is from, for example horse racing. MLB has set up a system where the best team, by definition, is the one that wins the World Series. No team has the goal of having the best regular season, just to be the one that wins in the World Series. So, does it really make sense to judge them by regular season performance when that was not the goal? Wouldn't the smarter good teams do just enough to make the playoffs (by resting pitchers more often, giving their best hitters regular breaks, etc), thus saving them for the playoffs and World Series? They would not do this if the goal were to be the best over the course of the regular season. So, we can't really judge their regular season performance justly because it is affected by the system that is in place. Incidentally, the same argument can be made for the Electoral College vs. Popular vote in US Presidential politics. The goal of the presidency is to win 270 electoral votes, so it's not really a fair comparison to extrapolate a national popular vote from that system when that isn't the goal of the candidate. It may be that the best regular season team has a surprisingly small probability of winning the World Series, but it still has a higher probability of winning the World Series than all of the other teams. (I would be interested in seeing that analysis, by the way.) So, there's not really a way to "optimize for the postseason" that doesn't involve building a good team for the regular season. This seems to live in the land somewhere between petty and frivolous. What's the point in making up arbitrary definitions of "best-ness" other than to comfort yourself by being able to justify that even though your team lost, they were still the best? I didn't know we cared about which team was "best" in sports. I thought we cared about which team won. Isn't this comparing apples and oranges. Or, taking the results of a marathon race (a 162 game season), and from those racers predicting which one would win a sprint ( a 7-game series)? Said the guy whose team lost! "So the playoffs should be thought of as entertainment." If the converse were true, and the playoffs were concretely predictive of the best team, would it not be considered entertainment? All of professional sports should be thought of as entertainment. What else could it be thought of? If I wanted a sport where the "best team" was determined by statistical analysis and computer calculations, instead of on the field of play, I would watch college football. Why does the team the Tigers played in an exciting 5 game ALDS series get namelessly billed as "after the best-of-5 series" while their other postseason opponents are specifically named? I think that part of the reason that most pundits got the World Series wrong is that they were intellectually lazy. They assumed that because the Tigers had the best pitcher in the game (Verlander) and a Triple Crown winner (Cabrera) that this automatically made them the better team, conveniently ignoring the fact that not only did the Giants win more games during the regular season (94 to 88), but that they did so in a much tougher division. "1) The fact that the Giants have game 6 and 7 at home is a huge advantage. In the last thirty years, only two teams have won the World Series by winning a game six on the road (1992 Blue Jays & 2003 Marlins), and home teams have won nine consecutive World Series Game 7's. And I don't think the Tigers are that much better than the Giants that they can win it in five. 2) The Giants defense and bullpen are both much better than the Tigers. The Tigers lineup is without a doubt better than the Giants, but the fact that they won't be able to use a DH in San Francisco will minimize the impact, as will the short series length, which always favors pitching over hitting (note how little impact the superior lineups of the Phillies and Rangers had against the Giants in 2010). 3) The long layoff has proven to make teams rusty....of the five teams to sweep an LCS 4-0, four of them lost the World Series, including the 2006 Tigers. Only the 1995 Braves swept the LCS 4-0 and went on to win the World Series. 4) People are overrating the impact of Verlander....don't forget that in 2010, the Giants beat Roy Halladay in Game 1 of the NCLS (who had pitched a perfect game in his previous start), and Cliff Lee in Game 1 of the World Series (coming off a shutout & two 1-run games), both of whom were as hot as Verlander is now. " All the really important data indicated that the Giants had a much better shot at winning the Series than most pundits gave them credit for. Tigers fans and the rest of the nation might have been shocked by the Giants knocking Verlander out in Game One, but I can tell you that most Giants fans weren't. And once the Giants won Game One and for the most part guaranteed that there would be a Game Six back in San Francisco (given that it would be unlikely for the Giants to then lose four straight given how well they were playing), the likelihood of the Giants winning the Series went up dramatically. The best team always wins, because this is how we have decided to determine who is the best. So, every year, in every sport, the best team wins the championship.